A superb quality games/side table attributed to T & G Seddon of Grays Inn Road, London. 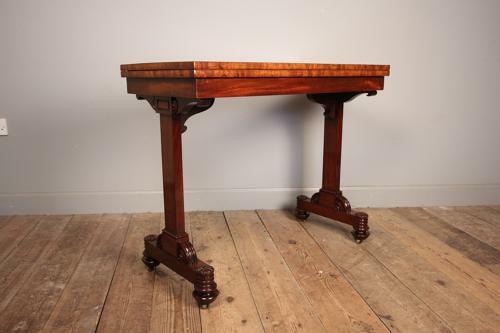 This William IV Mahogany table having a wonderful rich colour, made in the highest quality Mahogany. The rectangular top rotates 180 degrees and as it does so the end supports contract inwards, the top can them be unfolded making this a comfortable table for 4 to be seated. Having a green baize surface cross-banded in Mahogany. The whole raised on squat bun feet and retaining the original inset castors. English, Circa 1830. The firm of George Seddon existed in various manifestations between 1753 and 1868 and was one of London's leading furniture producers in the later part of the 18th century. T & G Seddon were Thomas Seddon II and George Seddon III, nephews of the original George Seddon and received a Royal Warrant in 1832. The firm's move from Aldersgate Street to Grays Inn Road is thought to have taken place around the same time.